Their technology protects data centres and enormous logistics halls, museums and trains. In May, the fire protection technology leader Wagner Group GmbH will be celebrating its 40-year existence together with its employees. A success story that began in a basement near Hanover, and is now being written all over the world. When company head Werner Wagner, a communications engineer, founded the company in 1976, its initial focus was burglar alarm technology only. Today, the name Wagner has become inseparably associated with innovative fire protection solutions. Based in Langenhagen (near Hanover), the Wagner Group holds over 700 patents. Its fire protection solutions can be found in museums and libraries, high-bay and deep-freeze warehouses, hazardous material storage facilities, as well as in hospitals, vaults and wind turbines. And the company continues to expand. “Our strength is our expertise at solving problems,” says Werner Wagner, who was recently awarded family entrepreneur of the year. “We don’t provide products, we provide solutions. 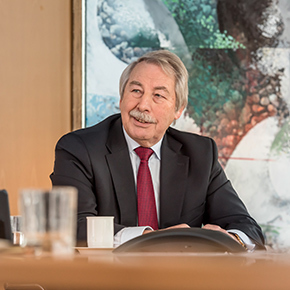 We offer our customers comprehensive fire protection concepts.” This corporate philosophy has a positive influence on the company: “During the 2015/2016 fiscal year, we increased our sales by roughly 10%, to €85.0 million,” says Werner Wagner. “This is much faster than the market. And we could certainly grow much more quickly, but we don’t even want to.” The company is already earning 30% of its turnover outside of Germany; since 2015, the company has been active not only in Europe and Asia, but also in the US and Canada—huge new markets for WAGNER to secure. WAGNER’s success is primarily based on two cutting-edge technologies. One is early fire detection with TITANUS®-brand air sampling smoke detectors, which detect fires very quickly and are safe from false alarms. The other is the OxyReduct® active fire prevention system, an oxygen reduction system and a pioneer in the field of preventative fire protection. OxyReduct® lowers oxygen concentration levels in areas containing large quantities of valuable goods within a densely packed space (such as warehouses, archives or data centres), so that fires cannot develop or spread. A third focus is FirExting® gas extinguishing technology. It uses special inert gases to ensure effective, residue-free extinguishing. Technical systems remain functional and important works of art, films or documents remain undamaged. One of the latest inventions to come out of the company’s headquarters in Langenhagen is a false alarm-proof air sampling smoke detector: the TITANUS MULTI·SENS® not only detects fires, it can also tell what it is that’s burning. This way, dust, vapour or cigarette smoke won’t set off the alarm. Customers look for solutions of this type to protect their production facilities, theatres or rail vehicles. “Nowadays, fire protection isn’t just about protecting people. “It’s essential to protect processes as well, since interruptions in operations are expensive and can even put companies out of business. We offer innovative fire protection concepts that ensure greater process reliability and protect data, goods, assets and operating procedures – which obviously always includes personal safety and the environment,” Torsten Wagner explains. The 49-year-old is a communications engineer like his father, and, as the company’s second Managing Director, is in charge of the Technology and Logistics divisions. The family-owned company’s success and continuity benefit its employees as well. Decision-making paths are short, so everyone is welcome to take part in shaping the company every day. As a result, its workforce is continuously growing: WAGNER is expecting to hire its 500th employee within the next few weeks—another milestone on its 40-year path to success. 1976 – the beginning: Qualified engineer Werner Wagner founds an engineering office for burglar alarm technology in Winsen (Aller). 1982 – the first large-scale order: The company develops and implements a burglar alarm concept to protect the entire outdoor premises of the nuclear interim storage facility in Gorleben with open field monitoring, which even a GSG9 special operations unit cannot overcome. The starting shot for a meteoric rise. 1994 – Pioneers in extinguishing technology: WAGNER becomes the first German provider with VdS system and installer approval to introduce nitrogen as a natural extinguishing agent on the market. 1997 – Revolution in early fire detection: After several years designing and installing numerous fire detection units for data centres, WAGNER decides to develop its own air sampling smoke detector, which will be capable of reliably detecting the tiniest particles of smoke with great sensitivity. 2000 – WAGNER goes international: The company’s first foreign subsidiary is founded in Austria. 2003 – WAGNER protects high-security area: Wagner comes to specialise more and more in IT security concepts. It provides an OxyReduct® multi-zone installation to protect a Munich data centre, along with all associated technological areas. The concept protects a total of 25 rooms. 2004 – WAGNER protects Telekom systems: Over ten years ago, WAGNER received its first order to protect Telekom’s technical systems with TITANUS®-family air sampling smoke detectors. With success: the companies are still closely connected today. 2009 – TITANUS® systems in space: Optimum safety for the crew and its equipment: The TITANUS MICRO·SENS® air sampling smoke detection system is used to protect the high-tech, highly sensitive laboratory and measurement equipment on the International Space Station from fires. 2013 – Award-winning: For the 2nd consecutive year, WAGNER wins the German Data Centre Award. TITANUS MULTI·SENS® receives the award in the safety category. The same year, OxyReduct® Compact receives the Préventica innovation award. 2015 – Fire prevention in the largest cold storage warehouse in the world: Preferred Freezer exports OxyReduct® technology to the USA for the first time: the newly developed PSA oxygen reduction system protects a fully automated high-bay warehouse with 1.05 million cubic metres of storage volume. 2016 – New technology can tell what’s burning. The TITANUS MULTI·SENS® appears on the market.